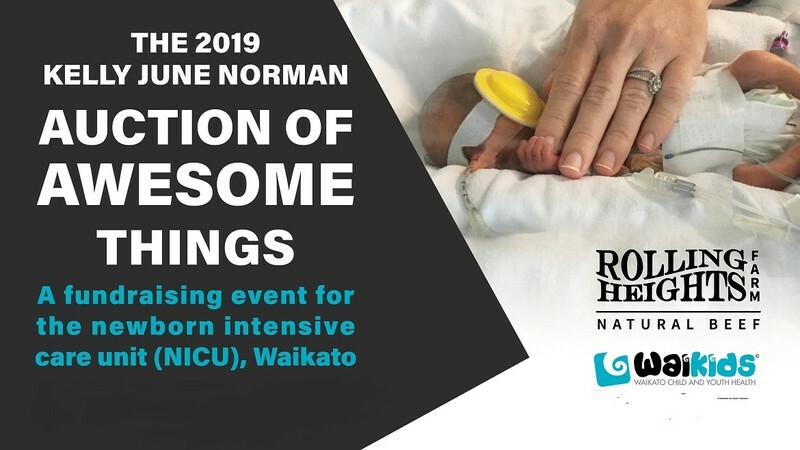 An unforgettable night out for colleagues and friends and a chance to raise funds for the newborn intensive care unit (NICU), Hamilton, in memory of Cory and Emily Norman's daughter, Kelly June Norman. A stunning three course menu co-designed by award-winning chef Joshua Harris, from Jervois Steak House in Queentown and the impeccable team at Zenders, will feature world-class beef from Rolling Heights Farm. The incredible Cam, Lou and Dillon from Two Many Chiefs will be performing two sets over the evening so make sure your formal and glamorous attire gives you room to move. As well as an exclusive night out with rare food, wonderful wine, company and internationally acclaimed entertainment, the highlight of the evening will be the auction of awesome things, in memory of Kelly June Norman. This will be your chance to view and buy some truly awesome prizes, from either the closed auction or the main auction event. Tickets to the event are on sale for $169.00 or $1,352.00 for a VIP table of 8. If you have an awesome auction item that you’d like to donate to this event, or you’re keen to sponsor the event, please get in touch. 6pm drinks reception. 7.30pm dinner. Doors open at 6pm.